Delicious, healthy, amazingly flavorful and sausage-y with an added element of the sea – all in one meal! If that is what you crave, that is exactly what you are going to receive with this dish. And it always feels great to get exactly what we want, doesn’t it? 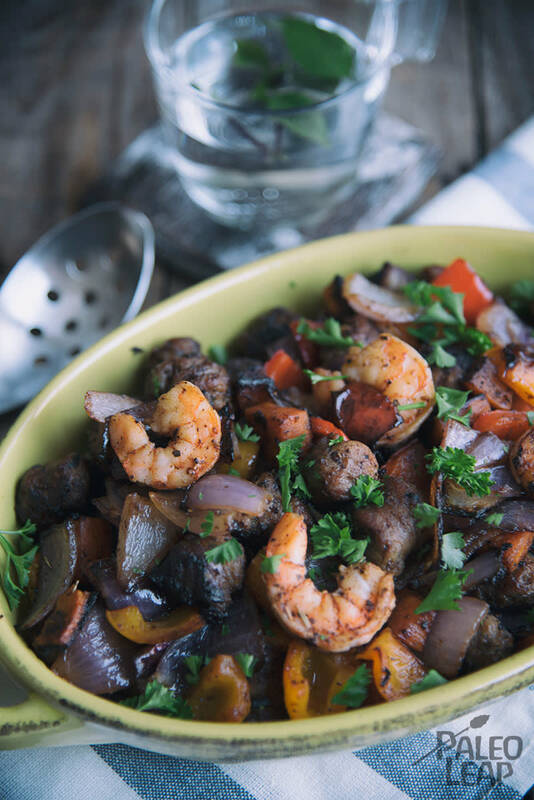 Take your favorite Paleo Italian sausages and combine them with a pound of cleaned shrimp, then allow the meal to naturally fall into place, your best skillet is quite useful for this job. Irresistible aromas will soon be wafting out of your kitchen, much to the delight of those invited to the dinner table. When on the hunt for the best Paleo sausages around, there are several things to consider. While sausages on the lower end of the price scale may equate to “junk food” or overly processed meat, with the upper end over-priced, there are many options in the middle. First things first, search for sausages with a natural casing, then take a quick peek at the list of ingredients – the shorter the list, the better. Stay away from any sausages with fillers such as flour (gluten-free or not), gums or texturized vegetable protein made from soy flour. When in doubt, you can always make your own sausages at home. Time can be demanding, so when hunger strikes, pick the best of the best and get to the stove – home cooked meals are unbeatable! If you are inspired by Cajun spices, you may want to try a Cajun-style steak with spicy mango glaze the next time around – it is fabulous. Heat some cooking fat in a skillet over medium-high heat. Brown the sausages until cooked through, 8 to 10 minutes. Add the onion, zucchini and bell pepper. Cook for 4 to 5 minutes. Then toss in the garlic, cook for another minute or two. Add the shrimp and cook until pink, about 2 to 3 minutes. Sprinkle everything with Cajun spices, and season to taste. Pour in the chicken stock, toss well and cook 3 minutes longer. Adjust the seasoning, and serve topped with fresh parsley.